Stocks settled firmly in positive territory Monday as Greece appeared on its way to a bailout approval and Apple shares jumped over $500, fueling gains on the Nasdaq. NEW YORK (TheStreet) -- Stocks settled firmly in positive territory Monday as Greece appeared on its way to a bailout approval and Apple shares jumped over $500, fueling gains on the Nasdaq. The Dow Jones Industrial Average finished up 72.8 points, or 0.6%, at 12,874. The S&P 500 rose 9.1 points, or 0.7%, at 1352. The Nasdaq added 27.5 points, or 1%, at 2931. Apple ( AAPL, breaking above an intraday level of $500 a share for the first time, helped the Nasdaq outpace gains on the Dow and S&P. The company, which hit $400 a share just a little over six months ago, has escalated its legal battle against Samsung by asking a California court to block sales of the Galaxy Nexus smartphone. In the suit, filed Wednesday in U.S. District Court in San Jose, Apple accuses Samsung of violating four Apple patents with its new phone, according to a Dow Jones . The new Samsung phone is considered by many to be the strongest competitor yet to its iPhone, posing a robust threat to Apple's market share. The broader market welcomed Greece's drastic plans to cut spending and wages, even as economists said that the same measures may be detrimental to the country's long-term growth. Riots spread across Athens overnight, with thousands of people protesting the latest demands from Greece's creditors.
" It appears that Greece has agreed to harsher austerity measures in return for a € 130 billion bailout package," say Jefferies analysts. "We remain skeptical that this is the end of the saga and expect further turbulence as other countries seek voluntary agreements." While several of the country's leaders have defected in recent days, roughly two-thirds of the Greek parliament voted to pass the new agreement, which also outlines a bond-swap plan between the government and private lenders that will reduce the country's debt by €100 billion. The austerity legislation should now clear the way for eurozone finance ministers to give Greece its second bailout of at least €130 billion, or $171.5 billion. Officials are expected to meet in Brussels on Wednesday to determine whether Greece will get this next round of aid. Borrowing costs fell at an Italian debt auction Monday, suggesting that investors' faith in the country to repay its debts has increased. The country was able to sell more than €12 billion of bills at rates lower than those in the previous sales. Germany's DAX closed up 0.68% while London's FTSE finished up 0.91%. Japan's Nikkei Average settled up 0.58% and Hong Kong's Hang Seng was up 0.5%. Despite apparent exuberance in the market, investors are wary of a pullback. "Not everyone can enjoy a meal without putting the fork down every now and again. And the same goes for equity price advances," writes Sam Stovall, chief equity strategist with S&P Capital IQ. Stovall's team recently downgraded information technology, one of the "higher-flying" sectors. "We believe it is more susceptible than most to a sharp, short-term decline in price. 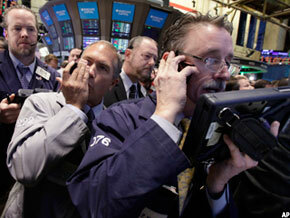 However, that doesn't mean our year-end target of 1400 for the S&P 500 is in jeopardy," he adds. Last week, U.S. stocks saw the worst slide yet in 2012. The Dow slipped 61 points as investors feared that Greece was headed for a default and as technical analysis suggested that a market top had arrived. In corporate news, conglomerate General Electric ( GE said it will hire 5,000 U.S. military veterans over the next five years and invest $580 million into growing its U.S. aviation operations in 2012. The announcement comes ahead of a four-day meeting in Washington beginning Monday to discuss ways to jump-start the U.S. economy. GE shares were up 1% to $19.07. Vodafone ( VOD, the world's largest mobile phone company, confirmed Monday it is considering making an offer for Britain's Cable & Wireless Worldwide. Vodafone said Monday it was "in the very early stages of evaluating the merits of a potential offer for CWW." If an offer were made, Vodafone said it likely would be in cash. Reports suggest Cable & Wireless might be sold for 700 million pounds or $1.1 billion to 900 million pounds. Shares edged 0.5% higher to $27.53. Diebold ( DBD, the maker of ATMS and bank vaults, reported better-than expected earnings of $1.26 a share and a revenue increase of 7.5% compared to a year earlier. Analysts were looking for earnings of 84 cents a share. Shares popped by 9.2% to $37.94. March oil futures were up $2.24 to $100.91 a barrel. In other commodities, April gold futures settled down 40 cents at $1,724.90 an ounce. The dollar index was down 0.02%. The benchmark 10-year Treasury was up 1/32, pushing the yield to 1.981%.